Bringing back hip-hop's fifth element. Zach and Steven sit down and hang out with one of the greatest producers and rappers in the history of hip-hop: the one and only Large Professor. 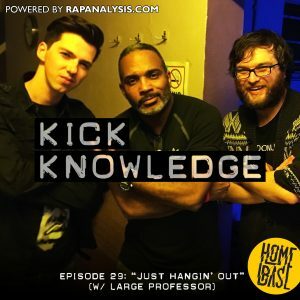 In this episode, Large Pro discusses with Kick Knowledge the magic and importance of New York hip-hop, his influence on hip-hop production, some of his production tricks, and some of his own favorite lyrics. Zach and Steven are joined in this episode by Kick Knowledge intern and Rap Analysis writer Nigel Telman, and discuss Lil Wayne’s Tha Carter V, Postmodernism, and our final thoughts on Kanye. In this episode, the dynamic duo talk about Steven’s birthday, what the hell even is trip hop and emo rap, and hip-hop’s influence in current top 40 pop music. Steven and Zach are ready for Season 2 of Kick Knowledge, and talk about hip-hop in Europe, MGK and Eminem, and some great books for hip-hop studies. It’s episode 25, and Steven and Zach have been on it with Kick Knowledge for a year now! 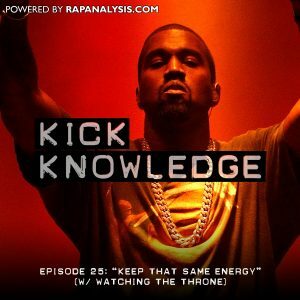 In this episode, Chris and Travis of the Watching the Throne Podcast discuss their fascination with the work of Kanye West, their infamous Twitter posts, and the future of Watching the Throne. Subscribe and stay tuned for more episodes! Check us out and listen to the podcast on this website, iTunes, MixCloud, and Stitcher.